Maundy Thursday, April 18, at 6:00 pm at Grace Church, Red Hill. We wash feet and strip the altar. Good Friday, April 19, at 6:00 pm at Grace Church, Red Hill for the solemn service that includes singing the rich hymns of the cross and reflections on the seven last words. At 6:00 am, Faith, Hope, and Love Church of Deliverance has invited us to their Easter sunrise service and breakfast at Good Shepherd Church, 960 Monacan Trail Road. ​At 10:30 am at Grace Church, Red Hill, we will celebrate the resurrection and sing alleluias. Please bring stemmed flowers to adorn the empty cross, a GC|RH tradition. An Easter egg hunt will be held right after the service in the churchyard. Please bring a basket in which to collect your Easter eggs. Check out Nan Macmillan hosting an open mic at the Front Porch on Easter evening. Consider remembering a loved one this Easter by making a contribution towards the purchase of Easter lilies for Easter Sunday, April 21. A list of those who we wish to remember in this way will be included in the Easter bulletin. Suggested donation is $12. Checks should be made out to Cynnie Davis and mailed to her at 5363 Bellair Farm 22902. Please include the name(s) of those who you would like to remember. 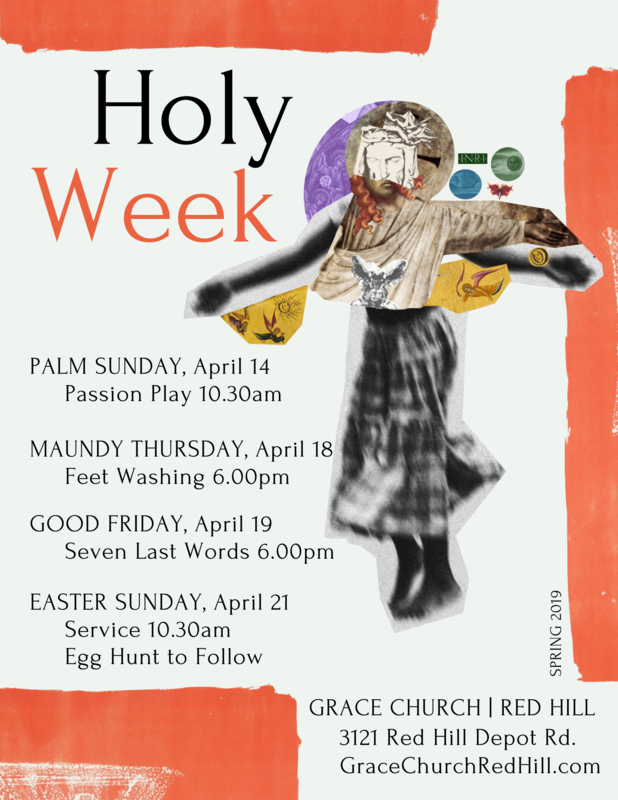 ​And, I've attached the GC|RH Holy Week flyer. The Interfaith Alliance for Climate Justice is running a Facebook fund-raiser for the Charis Community. Check it out! If you're not on Facebook take a look at the fund-raiser on this site. As the number of young children in our midst grows, members of Grace Youth Group would like to offer a short time of supervised play for mobile babies and toddlers during worship. Each Sunday, one or two members of the youth group will be in the Fellowship Hall play corner eagerly awaiting baby companions for about 30 minutes during the service: from the Gospel Hymn until we gather at the Communion table. Children of all ages are always welcome to remain with their families in the sanctuary, but we hope this will provide an simple option for little ones who need to move and parents who may want a moment of stillness. Talk to Kate (kjlichti@gmail.com) with any questions. Here's an opportunity to combine an exploration of whiteness with the practice of mindfulness. Grace Youth Group is planning a Civil Rights Tour this summer and we'd like to put an invitation out to the Grace Church community to see whether there is any interest in making this a church-wide, intergenerational trip. We plan to spend two days each in Birmingham, Selma and Montgomery, from June 8th to the 14th. The goal of the trip would be not just to see historical sites, but to trace this history into our lives today and these places to the places where we live. We hope the trip will be particularly rich in light of the work of our racial justice small groups this past year. Talk to Kate Lichti (kjlichti@gmail.com) if you're interested. Every Wednesday at 9:10 am, we host a time of contemplation at Good Shepherd, Hickory Hill at 960 Monacan Trail Road/Highway 29. The season of Lent derives its name from a Germanic word that means the lengthening of days. During Lent, the church practices the disciplines of fasting, almsgiving, prayer, and repentance—all of which seek to bring forth new spiritual growth in the longer and warmer days of spring. During past Lents, I have focused on fasting and on Tuesdays, would send you a short essay to encourage keeping a fast day. This season while the days lengthen, I will reflect on walking. While it’s not one of the traditional disciplines of Lent, walking as a spiritual exercise has all kinds of antecedents: Pilgrimages, crusades, journeys, missions. On the Tuesdays of Lent, we’ll explore aspects of walking that relate to new growth in our spiritual lives and explore how walking might make us more aware of ourselves and bodies, the world around us, and the animating being at the center of it all. The church has identified Lent with Earth’s orbit of the sun within the solar system’s multiple movements. In Lent, we experience that movement of seasonal change and the Jesus movement of transformation. In the lengthening days, we follow Jesus through the violence, abuse, supremacy unleashed by the principalities and powers and with Jesus find our footing in restored, healed, green, new life. I hope these reflections will be an invitation to walk for any amount of time and distance that you can manage and to regard walking as a spiritual discipline. In Lent, we turn to God in all dimensions of our lives as we wipe the ashes of death off of our foreheads and reorient ourselves to God’s way of life. To speak of God’s “way” implies movement and its essence. And both are embodied in walking. Solnit would say that when we walk, we align the mind, the body, and the world, “as though they were three characters finally in conversation together” (p. 5). When you walk this day, experience that alignment between your mind, body, and world and, with each breath and each step, that holy alignment with the One who generates and animates all living things. Dear God, give us the energy and intention this day to walk. And as we walk, direct us to your way, the way that brings harmony, balance, and alignment. Amen. Tuesday, March 19: Walking slows us down to the humble speed of 3 miles an hour—the average human speed of walking. Rebecca Solnit writes, “I like walking because it is slow, and I suspect that the mind, like the feet, works at about three miles an hour” (Wanderlust, 10). I would add that the senses join the feet and mind in thriving at that speed. At three miles an hour, you can see the wide 180-degree spectrum and notice movement, variations of light and color, the height of buildings and trees. You can hear a car horn, the drum of a woodpecker, the tussle of squirrels in the underbrush. You can smell the cherry blossoms, street food, saturated soil; you can touch the pavement or ground with each step, and, with the hand, the smooth edges of the crosswalk button and the tree bark’s rough contour. Life happens more readily, more immediately, more deliberately when you walk. When you walk today, God will be matching your pace, giving you life, and filling you with love. Dear God, you who are present in the depth of my life, match my pace this day and pour your love into my senses that I might be fully alive. Amen. Tuesday, March 26: In Lent, we turn to God in all dimensions of our lives as we wipe the ashes of death off of our foreheads and reorient ourselves to God’s way of life. I offer these reflections as an invitation to walk for any amount of time and distance that you can manage and to regard walking as a Lenten spiritual discipline. The spiritual practice of going on pilgrimage often entails setting one’s sight on a destination of some religious significance and walking to it. The destination may be a cathedral, a Holy Door, a shrine, a mountain summit, a tomb. While the specific destinations intrigue me, I find myself more interested in how the whole journey toward the destination has a sanctifying effect. Rebecca Solnit writes, “Pilgrimage is premised on the idea that the sacred is not entirely immaterial, but that there is a geography of spiritual power” (Wanderlust, 50). By moving the body, following the trail, engaging with other pilgrims and walkers, keeping silence, watching wind-blown branches, listening to spring peepers, and reaching a destination we interact with the material world as a spiritual experience. Solnit suggests that “…perhaps it reconciles the spiritual and the material, for to go on pilgrimage is to make the body and its actions express the desires and beliefs of the soul” (Wanderlust, 50). As you walk this day, let the geography guide you more deeply into your soul. And may you become aware of the Spirit moving through material and into the material of your heart. Dear God, as I walk today, reconcile in me the material and spiritual that you might reveal yourself in all I encounter. Amen. Tuesday, April 2: In Lent, we turn to God in all dimensions of our lives as we wipe the ashes of death off of our foreheads and reorient ourselves to God’s way of life. I offer these reflections as an invitation to walk for any amount of time and distance that you can manage and to regard walking as a Lenten spiritual discipline. Folks tell me about loneliness. Even if we’re fortunate enough to have a partner and maybe even a family, loneliness is an existential condition that leaves none of us untouched. That we all “walk that lonesome valley” may be true, but why sing about it? Perhaps we do so so that we don’t wallow in it, so that we don’t imagine that we’re the only ones dealing with it. Maybe in the moment of naming our loneliness, it loosens some of its hold over us. And perhaps by imagining loneliness as a valley to walk through, we end up walking through it and out of it. In Lent we can sing this song with Jesus and dare to resist the temptation to gloss over life’s messy, hurtful, and broken realities. His cross draws us to the depths of loneliness and forsakenness and into the heart of compassion and love. Today, walk that lonesome valley. And trust that even when the valley seems unending, God will provide you with the strength and resolve to keep walking, one step at a time. Dear God, Jesus walked that lonesome valley. Help me to walk this day through that valley and in so doing bring my heart into alignment with yours, compassionate and loving Spirit. Amen. Tuesday, April 9: In Lent, we turn to God in all dimensions of our lives as we wipe the ashes of death off of our foreheads and reorient ourselves to God’s way of life. I offer these reflections as an invitation to walk for any amount of time and distance that you can manage and to regard walking as a Lenten spiritual discipline. While it may be that the only constant in life is change, change that is intentional or change that we are open to can be transformative. Here is Rebecca Solnit: “As Nancy Frey writes of the long-distance pilgrimage to Santiago de Compostela in Spain, ‘When pilgrims begin to walk several things usually begin to happen to their perceptions of the world which continue over the course of the journey: they develop a changing sense of time, a heightening of the senses, and a new awareness of their bodies and the landscape’” (Wanderlust, 51). To walk as a spiritual practice is to be open to transformation. We observe Lent as a time of transformation from shorter to longer days, snow to rain, dormancy to vitality, death to life. On today’s walk, be open to your own spiritual transformation, and imagine that all of us walkers are walking toward a collective transformation that embraces the Spirit’s gifts of release, reconciliation, and renewal to all. For we are all pilgrims. Dear God, as I walk this day, lead me and guide me toward transformation. Amen. Please keep Willard Taylor, Ted Burns, Kirsten Wittkowski, Federico Flores, Gene Corrigan, and the Charis Community (Dominique, Mark, Anna, Eric, Claire, Shanel) in prayer.